SilverFast Ai (for Plustek) award-winning scanner software sets a new standard for ease of control and sophistication for desktop scanners (film and flatbed). SilverFast Ai is high-end scanning and image optimization software from LaserSoft Imaging, a pioneer in desktop high-end imaging. SilverFast is now available for more than 315 scanners and digital cameras running under Mac (also OS-X) and Windows.SilverFast Ai is individually adapted to each supported scanner and therefore can get the very best out of each scanner.SilverFast Ai combines a very intuitive user interface with sophisticated and professional scanner and image controls. Beginners and professionals will appreciate the unique real-time controls and the intelligent automatic functions as well as the ability to manually adjust the image at any point.Predictable color from the SilverFast Ai preview gives imaging and color reproduction a new dimension securing the correct workflow with the ScanPilot. The professional user can adjust any operation via numerical input and can precisely monitor the results using the integrated densitometer. SilverFast Ai enables any level of user to achieve brilliant results quickly !SilverFast comes in three different flavors: as Stand-Alone Software with the SilverFast Launcher; as native Adobe Photoshop Plug-in or as universal TWAIN Module.SilverFast 6 also has the Job Manager, a productivity function, so far only available as an option!SilverFast Ai and SilverFast HDR are working in full 16 (48) bit mode and besides delivering uncorrected output into 48 bit HDR-format, also allows full 48 bit color-corrected output. Thus enabling the optimum throughput while securing maximum dynamic range!SilverFast Ai Studio includes all of the well-known functions of Silverfast AI plus a many new, innovative tools. 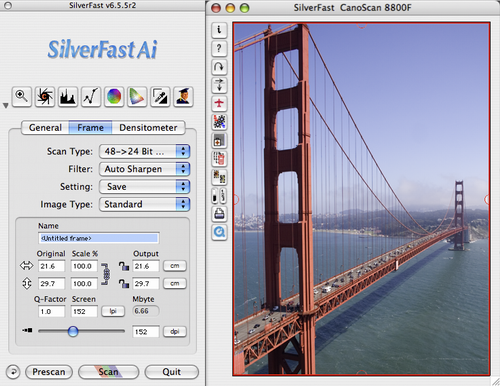 SilverFast Ai users can download the new SilverFast Ai Studio features as an upgrade for a reasonable price.